Valeport’s new fastCTD Pro? ler is designed to deliver high quality CTD casts at rapid drop rates. Created for coastal and oceanographic pro? ling, this new pro? ler is an evolu- tion of Valeport’s popular miniCTD instrument. The system incorporates Valeport’s world-class technology to allow the fastCTD Pro? ler to deliver the highest quality pro? les in a lightweight and robust package. Conn connector for standard RS232/RS485 communication. 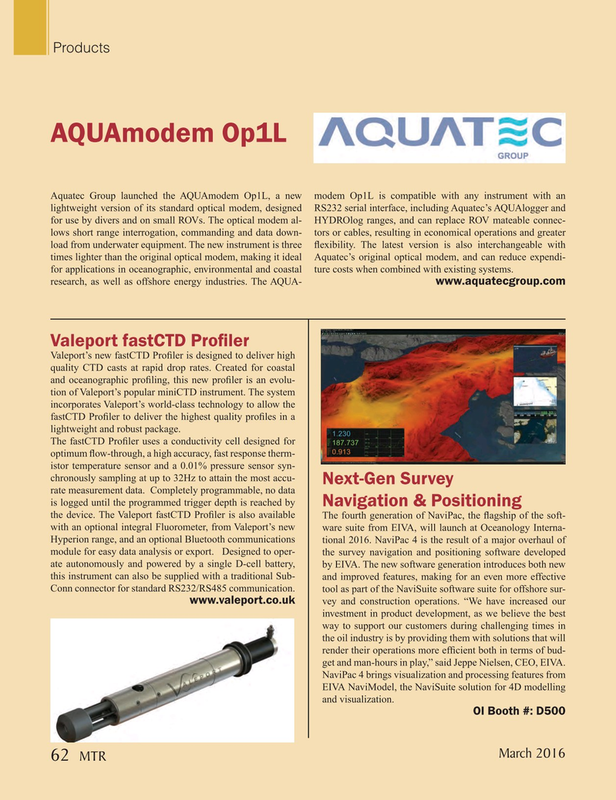 tool as part of the NaviSuite software suite for offshore sur- www.valeport.co.uk vey and construction operations. “We have increased our investment in product development, as we believe the best way to support our customers during challenging times in the oil industry is by providing them with solutions that will render their operations more ef? cient both in terms of bud- get and man-hours in play,” said Jeppe Nielsen, CEO, EIVA. EIVA NaviModel, the NaviSuite solution for 4D modelling and visualization.